In a country well-known in the music world for Extreme Death Metal, Poland doesn’t exactly produce swaths of Rock bands; the closest I’ve come is Power Metal act EXLIBRIS. 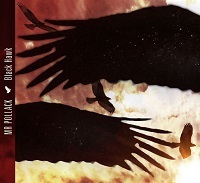 However, from the town of Mielec comes MR. POLLACK, from the completely opposite direction, playing a mellow, upbeat and incredulously-catchy blend of Hard/Pop/Blues Rock. Granted, since any and all information about them on the internet is in Polish, I know nothing else about them, except for the fact that they are veterans of their scene and recently released an album titled “Black Hawk”. Much to the likeness of Ace Frehley, SCORPIONS and nearly every AOR band under the sun, with a touch of Metallic grittiness thrown in, “Black Hawk”’s opening (and titular) track may as well be the album’s honorary anthem. One will notice from the onset, two glaring obvious things about this band: they’re not America. Vocalist Jacek Polak (it’s becoming increasingly obvious whom the band is named after) delivers his vocals in a noticeably thick Polish accent, adding endearing, verging on exotic. Secondly, the production of the album in general, is pristine; the mixer master managed to avoid over-compression, which plagues much of the genre’s music, the drums cutting through as organic, nary a snare trigger in earshot. Capitalizing on uplifting, BON JOVI-like choruses are classy, mature numbers like “The Plan B” and “Power And The Glory”, which contrastingly also keep their verses on the mellow side, with tasteful, clean guitar noodling and tender vocals. The beauty of this album shines through in its dynamics; rather than being a traditional 10-track-4/4-4-chord AOR bore, the band has borrowed from a wide array of genres; the chunkier side of Hard Rock present on DEEP PURPLE albums in “Gold And Money”, the cheeky jives found in the melodic, Classic rock of the KISS era in “Power And The Glory”, and even some funky numbers such as “Socrates” and “I Know You”. Both of the latter tracks are, interestingly enough, my absolute favourites on the album, displaying remarkable musicianship and love for creative and dynamic instrumentation and arrangement, with “I Know You” showing off fantastic bass work, and Jacek’s mind-blowing vocal range. The album closes with a number of re-recordings of certain tracks with the lyrics instead sung in Polish; “Jak Skala (Stand Up And Run)” and “Sokrates” providing an interesting spin on things. Already my favourite rock album of the year, the band have managed to record a totally unique piece of work, that is able to point us wistfully in the direction of familiar genres without sounding like any one band in particular.